Meet Lucca--the little munchkin we adopted a week ago who's been taking up all our time (in the best of ways!). She's been such a fun adventure already and we love spending every minute with her. We named her after Lucca, Italy (the hometown of my grandparents). 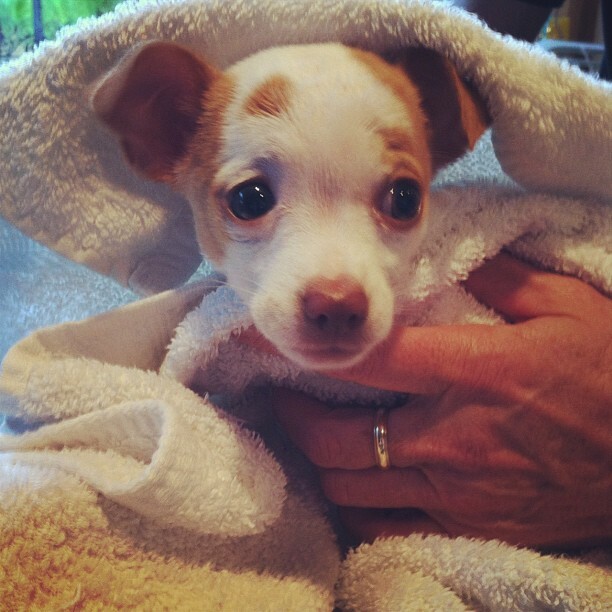 This photo was taken after her first bath--she was such a trooper! Stay tuned for exciting news later this week! Oh, so adorable! I really want a puppy. what a cute little doggie! She could not be more adorable. Love her inspired name too. Lucca is adorable! I love the little brown spot on her head. Congrats on your new puppy. I've volunteered for a number of animal rescues throughout the years and it's so great you adopted! There are so many homeless cats & dogs who need some love & a furever home. what a cutie! do you know her breed? what a sweet little puppy! best of luck with her! Ohhh,what a baby! Whats her brand...lol? So adorable! You guys I bet are great doggy parents! oh my goodness... the cutest little thing, ever!! so cute! good luck with puppyhood! it's exhausting! I wouldn't be without my little dog, he provides so much fun and entertainment, they really do become a member of the family. Enjoy your new addition to the family! She is so cute! I love puppies (well, I love dogs too, but something about puppies make them even cuter)! She will bring you so much joy and happiness, and a lot of work as well--but it'll be worth it! Congrats on your new puppy! I'm going to have to show my hubs! I've been wanting a little pup so bad! I really want a little bulldog, I think they are the cutest! awwww she is soooo adorable!! What a cute!! I want a puppy so much. I can't wait for the day when I have a backyard for it to run around in. Awww she's so cute, I want a puppy sooo bad. what a little love bundle! ^Follow the link to our blog for all things chic, fabulous, fun, and Sara Campbell! oh my gosh he is so cute! Congratulations on your new little cutie! he is sooooo cute,mygod i'm dying! Awww too adorable. I love her spot on her forehead! Oh my gosh. I am a dog lover to the core! This picture just made me melt! So adorable! Love her name too. What kind of pup is she?! So adorable. Oh. My. Goodness. She is SO stinkin' cute! She's adorable! :) Congrats on your little addition! adorable!!! and I love the name!! cutie patootie! love the name! you aren't supposed to bathe puppies!!! adorable, he reminds me of Peter, my brother's dog....except Peter is black and white.